Ever wish you could re-do prom? Dressing up, the lights, the music...the magic? Savannah, get ready for an evening more magical than any dance you've attended before. 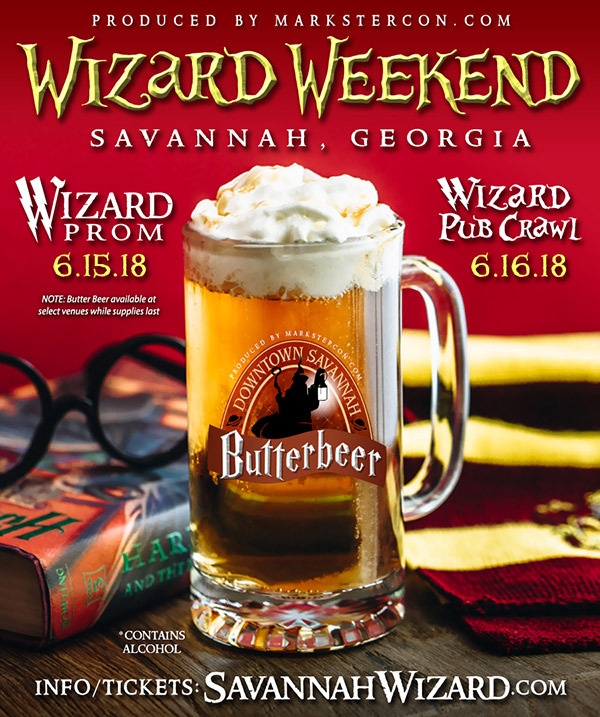 Get dolled up in your dresses, your house-color ties, or even your house robes, and join us at the Savannah WIZARD PROM 21+) – a Potter inspired celebration – produced by www.MarksterCon.com (producer of the next day's Wizard Pub Crawl (Savannah, GA) as we bring a WIZARD WEEKEND to Georgia's oldest city! 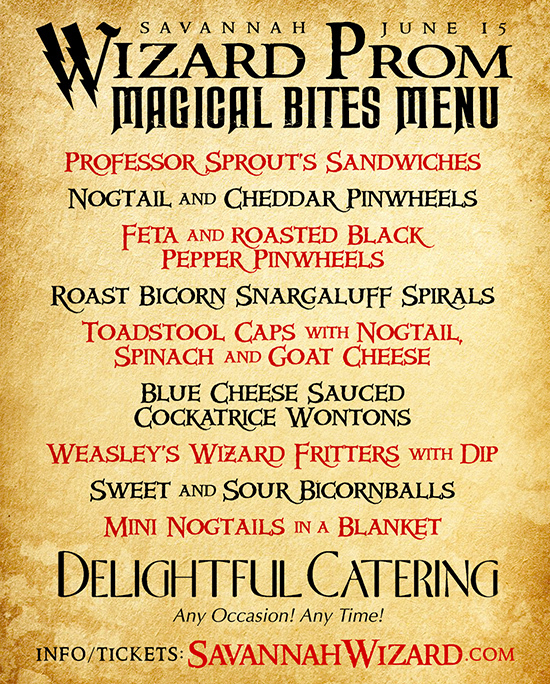 Feel like paying homage to your most beloved wizard-themed character or other famous wizards and witches? All are encouraged to join us as well! There will be a Wizard & Witch Costume Contest were you can show us your charm while you step into the shoes of characters we all know and love....or for those wizarding professors out there, we all love to hate. While costumes are strongly encouraged, they are NOT required, as we are fans of non-wizards too! NOTE: Muggle clothing is requested to be semi-formal to formal (i.e. no street wear allowed)! 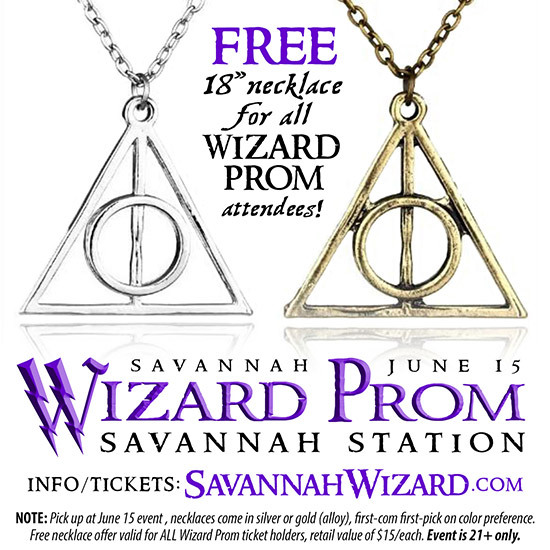 • Yes, there will be free potter-themed Prom Photos in addition to the crowning of the WIZARD KING & QUEEN! • Radio Cult (live music): Since 2005, Radio Cult has performed over 1,000 shows including conventions, casinos, weddings, fraternity parties, corporate events and festivals as well as in bars, concert halls and other music venues from their hometown of Atlanta, GA all the way to Los Angeles, CA and London, UK. The members of Radio Cult LOVE to play in a band and it shows. When the band has fun, the crowd has fun and with Radio Cult the crowd really has a blast! • In addition to butter beer and a few other wizard-themed drink specials, Savannah Station will have a fully-stocked bar ready for your requests. NOTE: We will release more info. on wizard-themed drink specials, etc. as we get closer to the June 15th date. NOTE: Due to limited parking we highly encourage attendees to take UBER/Lyft or maybe even a limousine (you can fit a bunch of your fellow wizards in there with you! • Be one of the lucky 'Early Wizard' ticket purchasers (starting at 7pm on April 10th) and you'll have a hand crafted, boxed CHOCOLATE TOAD waiting for you at the prom! We'll even have them ready in your chosen house color box label. • A limited amount of $25 'Early Wizard' tickets will be released at 7pm on April 10th. These reduce-priced tickets will be available until May 1st (or until 100 tickets have been sold, whichever happens first). After that tickets increase to $35 from May 1st-June 1st and $40 after June 1st. NOTE: Tickets will NOT be available at the door on June 15th, so if you want to attend, your ticket(s) MUST be pre-purchased. But much like the unpredictable Room of Requirement, we can't guarantee they'll be around until for long – so we encourage you to reserve your tickets sooner than later! • Smoking is NOT allowed within the Savannah Station facility, however; there is a large outside patio space accessible via the main room for those interested. 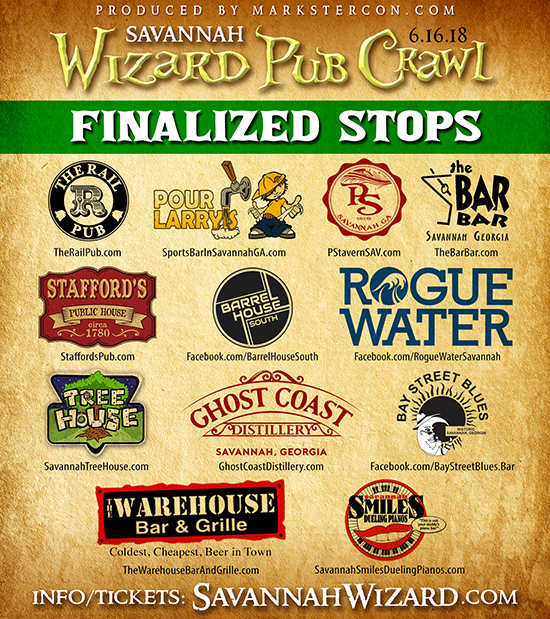 Following 3 year's of sold out wizard themed pub crawls in Atlanta and Athens, Markster Con's WIZARD PUB CRAWL is expanding to Georgia's oldest city – Savannah! 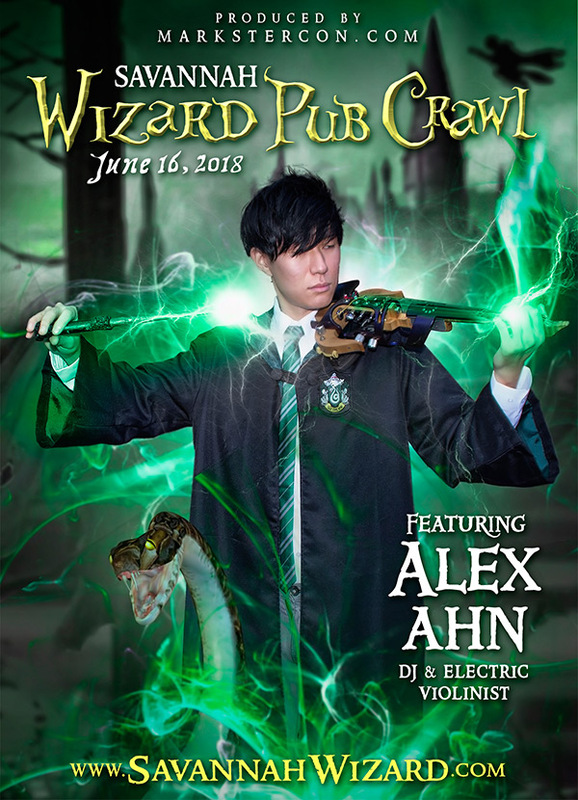 Come out Saturday, June 16th, 2018 for a stroll through some of Savannah's most magical pubs with various pubs hosting wizard themed stops (Wizard Registry, Badger's Burrow, Snake's Pit, Lion's Den and Eagle's Nest), along with special, magical themed shots, a wizard costume contest, photographers, a House Points contest (via Colored Event Badges), exclusive drink/shot specials and much more! • Pre-registered attendees who purchase by 6/1/18 (midnight) will get to pick their own house color commemorative event badge. On the back of the badge will be a list of House Point tasks that attendees can try to achieve during the crawl. Afterwards they can return to the GRADUATION GATHERING (location TBA) and claim their personalized Attendance Letter after presenting and Free EXPECTO HANGOVER shot glass (available for those who register by 6/1/18). • Who doesn't like to get their photo taken!?!? We will have different photo stations, available only for registered attendees with a colored event badge! • Registered attendees will get a FREE, commemorative 8.5" x 11" Wizard Pub Crawl ATTENDANCE LETTER. • Registered attendees will get their own special printed issue of the Savannah WIZARD WEEKLY, highlighting the event during the night, as well as a map of pub crawl stops, contests, exclusive discounts at participating businesses, description of the "House Points" contest and how to earn your own Wizard Pub Crawl ATTENDANCE LETTER (frameable) at the end of the event and much more! • While at WIZARD REGISTRY, attendees will receive a collectible 1.25" WIZARD PUB CRAWL pin according to their House Colored badge of choice (available for those who register by 6/1/18). -------> Much more info. to be released as we get closer as far as official pubs stop, drink/shot specials, photo ops, House Points competition and more! The ticket holder acknowledges that by attending the Savannah WIZARD PUB CRAWL on June 16th, 2018 he or she (or their likeness) may be recorded (by video, sound or otherwise) and consents to such recordings and its publishing and re-broadcasting. In exchange solely for this license, the ticket holder, in purchasing a ticket: (i) releases the event producer (Markster Con Productions LLC) and participating venues and their associates from any liability for loss, death or damage to persons or property, infringement of any right, or any other claim or cause of action of any kind; (ii) authorizes and permits the event producers and its designees to use for any and all purposes his or her name, voice, and likeness and all reproduction thereof in any and all forms and in all media now or hereafter known in perpetuity. This ticket is non-refundable and will not be replaced. The ticket holder also acknowledges that they are 21 years of age (or older) and that any alcohol consumed will be the responsibility of the ticket holder. The ticket holder also agrees to drink responsibly and bring a designated (sober) driver along with them to the event for safe transportation to and from, if the ticket holder plans to consume alcoholic beverages.